The results of Kickstarter may be a massive topic of debate in regards to quality and success, but that hasn’t stopped games fans flocking to the crowdfunding website to slap down cash and help get projects made. Kickstarter have revealed the levels of funding received during 2014, and the games category gathered an impressive $89 million. That figure is split between 1,980 projects. It’s important to note that the ‘games’ category covers board and card games too so not every cent of that figure landed in the laps of PC developers, but it’s certainly a huge percentage of it. The most successful game project of the year was Kingdom Come: Deliverance, a realistic RPG set in the middle ages. With 35,384 backers it raised $1.1 million; a massive increase over its modest $300,000 target. 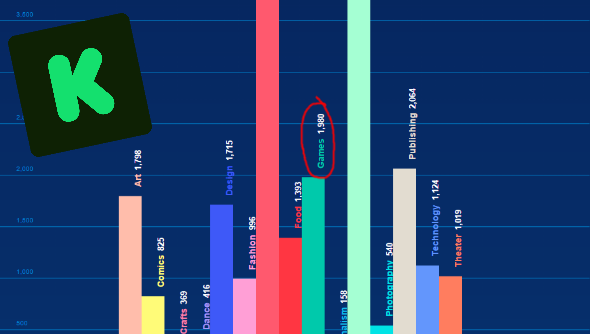 We’re used to hearing about Kickstarter as a medium for launching games that publishers wouldn’t normally touch, but games are only the fourth most funded category on Kickstarter, falling behind Music, Film, and Publishing. Still, with 1,980 successfully funded projects, it looks like Kickstarter remains a prime arena for getting games financed. Is this a sign that Kickstarted games are continuing to gather momentum, or will 2015’s stats reveal a lower figure as more gamers become skeptical of crowdfunding?